Volunteers picking up trash on Saturday were, l. to r., George Harris (kneeling), Tim Logan, Jane Logan, Tom Ronayne, Wayne Head, Woody Roth, Barb Pudlo, Mike Pudlo. Not pictured are Ange Ronayne and Fred Kanter. 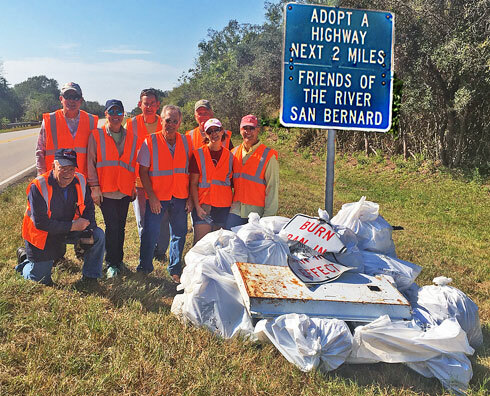 Friends of the River SB volunteers, in partnership with TxDOT’s Adopt-a-Highway program, picked up thirty-plus bags of litter, a large fluorescent light fixture, pieces of a burn ban sign, and miscellaneous other big items, This was along a two-mile stretch of FM 2611 at the Churchill Bridge on Sat, Nov 5th. Trash pickups are scheduled following mowing of the roadway by TxDOT. This year’s total trash collection includes some 68 bags of trash, a TV, a mattress, two satellite dishes plus the items collected on Saturday. Volunteer participation sends a clear message that their efforts really do make a big difference.